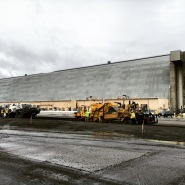 MOUNTAIN VIEW - Working nights, weekends and in the rain, the Construction Division has had a hand in transitioning Moffett Federal Airfield into a hub for Google, which entered a 60-year lease for the former military site in 2014. What began as a three-week $300,000 project morphed into a $1.8 million job with four additional projects bolted on by general contractor Turner Construction. 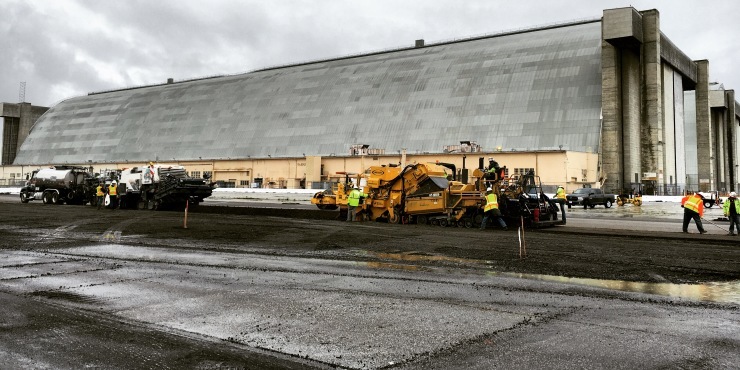 Graniterock began working as a subcontractor for Turner in March to re-pave the frontage road and a giant parking area for Google buses. The project, won by Estimators Paul Cianciarulo and John Torres, includes pouring a concrete apron with material batched from Redwood City, improving ADA access points, widening the road used by Google buses to enter the parking lot next to the iconic hangars and upgrading the Ellis Gate checkpoint. 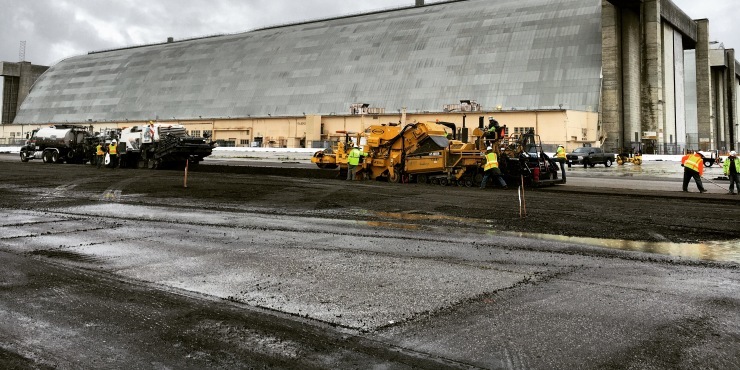 The 250,000-square-foot bus parking lot was resurfaced bythe cold in-place recycling team in two days, which CIR Manager Dennis McElroy said was a record. 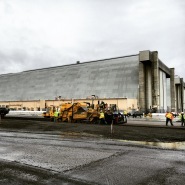 The job called for 3,200 tons of asphalt from the Redwood City plant. Matt Wadiak, Kevin Jones, Olon Hicks, Christian Thompson, Anthony (Tony) Lewis, David Aranda, Rusty Jordan, Mark Hurley, Andy Godina and his paving crew, the CIR crew, FMG Grinding crew, Ed Schwartz and Miguel Zarate.